On the edge of Greaves Arms Car Park. A pyramidal group of soldiers in trench scene surmounting square plinth with panelled doors. Dedication and names are inscribed in relief on bronze plaques mounted on the churchyard wall. 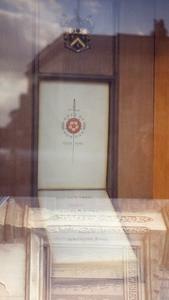 There is a recess in the plinth with a glass front, containing a mechanical Roll of Honour. It is reported that the inside chamber originally contained a roll of honour of the fallen and space for praying. Information shown: Surname, forename, decorations. 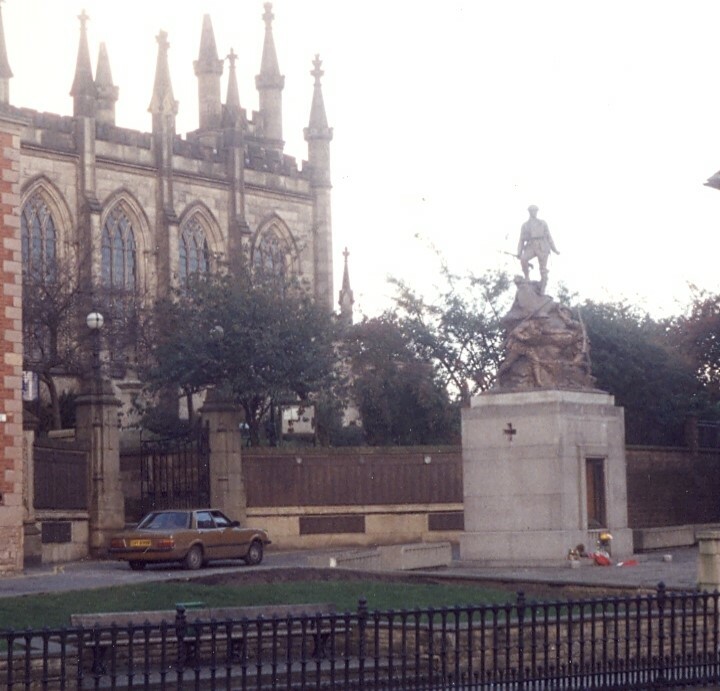 Oldham War Memorial, including memorial wall, piers, gates and steps to St Mary’s churchyard and forecourt walls, steps and balustrade (south side), and railings to St Mary's Churchyard (west side). An application for this war memorial was received through the Grants for War Memorials scheme in 2012. The main concerns were regarding the condition of the bronze and the memorial book. Due to the high costs of this project, having been quoted at £73,640 for the eligible elements, and the availability of funds at the time, a grant of £30,000 was offered. This was in excess of the maximum offer of £20,000 which was then available through this scheme and was in recognition of the soon to be increased maximum. The works to the World War II mechanised memorial book were not eligible for funding as only one quote had been received for this element. The main element of the works was the cleaning and repatination of the bronze sculpture and plaques. This had historically been inappropriately cleaned and a type of bronze coloured lacquer applied which had subsequently started to break down allowing water to become trapped underneath causing the bronze to deteriorate. The first stage of the project was to try and establish an appropriate method for removing the lacquer. It was determined that the use of a Dichloromethan paint stripper and steam cleaning was the most affective and least invasive way for this. It was evident prior to removing this lacquer that there were areas of corrosion and salt deposits on the bronze. However, only by removing the failing finish was it possible to fully evaluate the condition of the bronze. On inspection it was evident that the bronze had been damaged by the previous inappropriate treatment with pitting and a rough finish to the bronze having been caused by aggressive cleaning. There were also areas of corrosion which needed to be addressed before the memorial could be treated. As such a combination of steam cleaning and Jos cleaning was required to appropriately remove deposits on the surface of the bronze to allow treatment. The treatment of the bronze sculpture included the filling of holes and pits in the bronze using a combination of bronze mesh, bronze loaded resin and coloured wax. The sculpture was also repatinated using potassium sulphide before a protective layer of microcrystalline wax was applied. 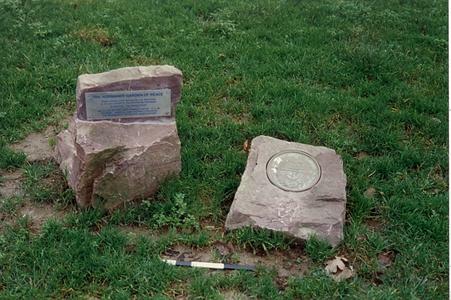 The memorial plaques had to be removed from the wall to allow repairs to the wall and to take a mould of the plaques which will allow their reproduction should this ever become necessary. The plaques were also cleaned, repatinated, the fixings were upgraded and some elements which had been lost were remade before being reinstalled on the church boundary wall. 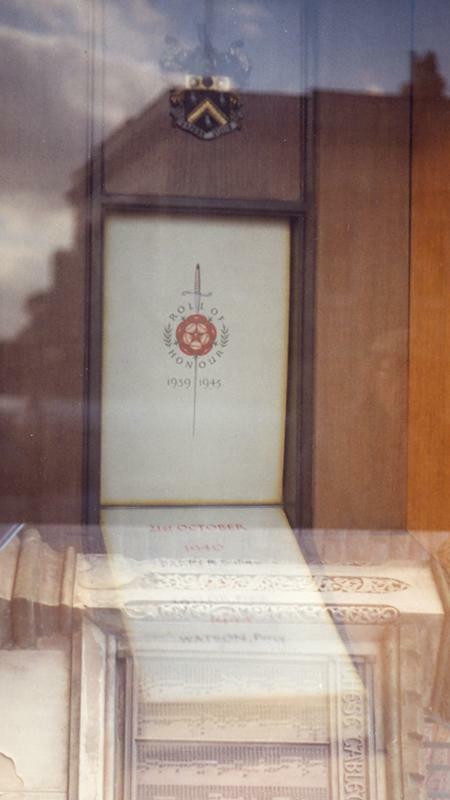 The granite plinth of the war memorial was in good condition and only received a light clean and works to ensure it is weather tight as water had previously been entering the structure which had resulted in damage to the World War II memorial book; c1950s: The memorial originally had two sets of bronze doors. One of these sets was removed to create a recess for the placement of a mechanised Roll of Honour for WW2. 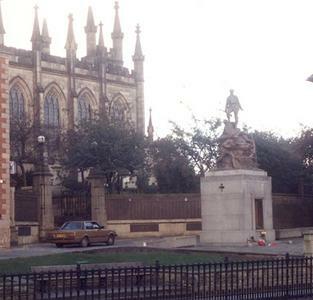 Comments: The project cost for the memorial was £93,816. 97. In 2012 the Memorial needed to be refurbished. In 2011 the Local Authority of Oldham pledged £50,000. 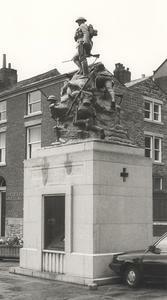 This combined with the War Memorials Trust's financial contribution of £30,000 in 2012 was used to refurbish the memorial. Purpose: The drive to create a World War I memorial in Oldham began shortly after the end of the war with a target to raise £20,000. This was intended to provide financing for both the war memorial and scholarships for children who had lost their father with any money left over going to the Oldham Royal Infirmary. Manchester Evening News 2013, 31 Jan. "Memorial facelift is tribute to heroes".